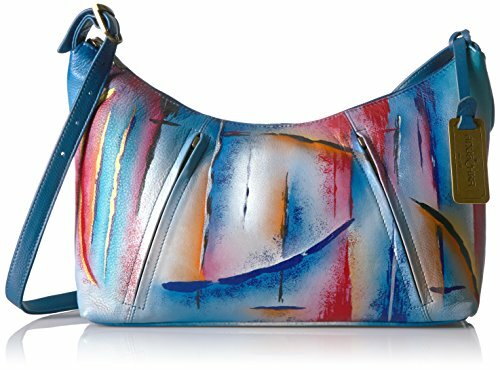 Hand painted leather purses are truly eye-catching, unique and cool. In fact they are currently trending like crazy! Obviously when you combine beautiful hand painted art, on fine quality leather the result is a timeless and charming creation just for you. Furthermore, You will appreciate these beautiful leather painted purses and bags are also functional meaning you can look fantastic while on the go. Floral hand painted leather purses are crazy popular right now. Especially true with spring and summer around the corner. In fact I love floral hand painted leather purses so much I have a couple! My favorite by far is the purple over the shoulder bag as it is great for carrying stuff not to mention constant compliments. In fact do not be surprised when you get constant compliments and questions about your adorable new handbag. Take a walk on the wild side with one of these bold yet sophisticated animal hand painted leather purses. You will love that there are a wide variety of these painted leather purses meaning you can find something that speaks to you. Admittedly I love cats so I really think the Jungle Leopard Leather Purse is adorable! I absolutely could not discuss painted leather handbags without mentioning Anuschka leather handbags as they are the epitome of extravagance and beauty. In fact take a look for yourself and draw your own conclusion. In addition to being beautiful these hand painted leather purses are also highly functional. For example Anuschka leather purses have pockets for important things such as cell phone or a water bottle.